There are more bicycles than residents in The Netherlands and in cities like Amsterdam and The Hague up to 70% of all journeys are made by bike. 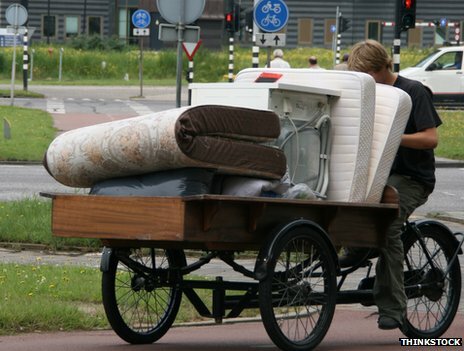 The BBC’s Hague correspondent, Anna Holligan, who rides an omafiets – or “granny style” – bike complete with wicker basket and pedal-back brakes, examines what made everyone get back in the saddle. Before World War II, journeys in the Netherlands were predominantly made by bike, but in the 1950s and 1960s, as car ownership rocketed, this changed. As in many countries in Europe, roads became increasingly congested and cyclists were squeezed to the kerb. The jump in car numbers caused a huge rise in the number of deaths on the roads. In 1971 more than 3,000 people were killed by motor vehicles, 450 of them children. In response a social movement demanding safer cycling conditions for children was formed. 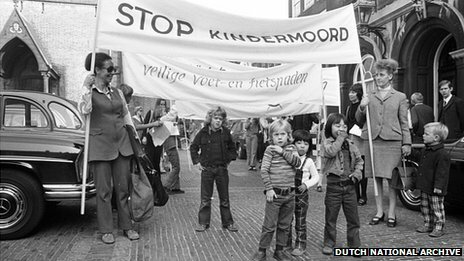 Called Stop de Kindermoord (Stop the Child Murder), it took its name from the headline of an article written by journalist Vic Langenhoff whose own child had been killed in a road accident. The Dutch faith in the reliability and sustainability of the motor vehicle was also shaken by the Middle East oil crisis of 1973, when oil-producing countries stopped exports to the US and Western Europe. 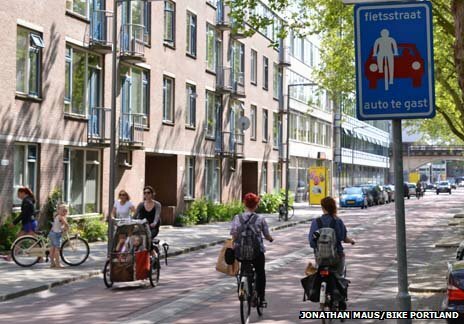 These twin pressures helped to persuade the Dutch government to invest in improved cycling infrastructure and Dutch urban planners started to diverge from the car-centric road-building policies being pursued throughout the urbanising West. To make cycling safer and more inviting the Dutch have built a vast network of cycle paths. These are clearly marked, have smooth surfaces, separate signs and lights for those on two wheels, and wide enough to allow side-by-side cycling and overtaking. In many cities the paths are completely segregated from motorised traffic. Sometimes, where space is scant and both must share, you can see signs showing an image of a cyclist with a car behind accompanied by the words ‘Bike Street: Cars are guests’. At roundabouts, too, it is those using pedal power who have priority. 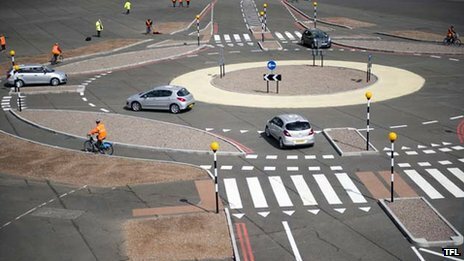 You can cycle around a roundabout while cars (almost always) wait patiently for you to pass. The idea that “the bike is right” is such an alien concept for tourists on bikes that many often find it difficult to navigate roads and junctions at first. 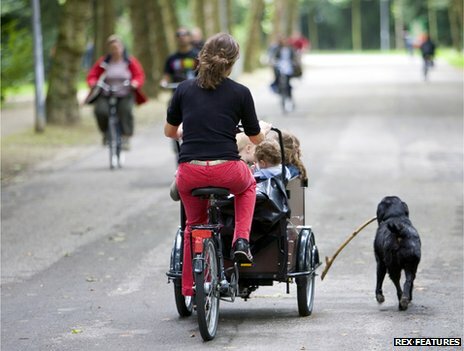 Even before they can walk, Dutch children are immersed in a world of cycling. As babies and toddlers they travel in special seats on “bakfiets”, or cargo bikes. These seats are often equipped with canopies to protect the children from the elements, and some parents have been known to spend a small fortune doing up their machines. As the children grow up they take to their own bikes, something made easier and safer by the discrete cycle lanes being wide enough for children to ride alongside an accompanying adult. And, as the Dutch are not allowed to drive until 18, cycling offers teenagers an alternative form of freedom. The state also plays a part in teaching too, with cycling proficiency lessons a compulsory part of the Dutch school curriculum. All schools have places to park bikes and at some schools 90% of pupils cycle to class. 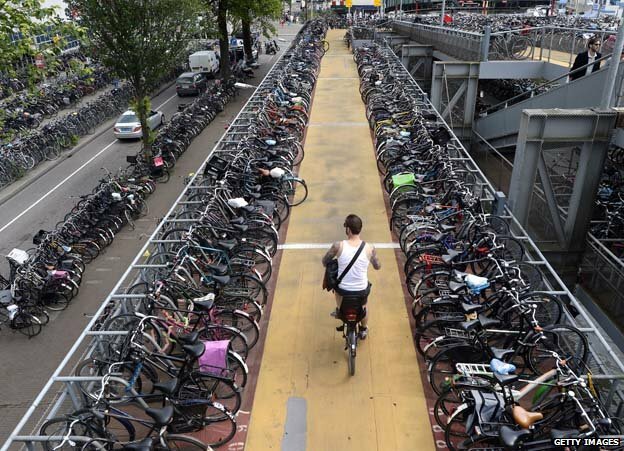 In the university city of Groningen, a cyclists’ dream even by Dutch standards, the central train station has underground parking for 10,000 bikes. Cyclists are accommodated in the way motorists are elsewhere, with electronic counters at the entrance registering how many spaces are available. Bike parking facilities are ubiquitous in The Netherlands – outside schools, office buildings and shops. In return you are expected to only lock up your bike in designated spots – if you chain your bike in the wrong place you could find that it is removed and impounded, and that you will have to hand over 25 euros to get it back. At home, even people who live in flats without special bike storage facilities can expect to be allowed to leave their bikes in a communal hallway. In the 16th Century, houses in Amsterdam were taxed according to their width, a measure residents countered by building tall, narrow houses. So hallways get filled with bikes – but so many people cycle, no-one really minds, and just clambers past. SOURCE: EUROPEAN COMMISSION FUTURE OF TRANSPORT REPORT 2011. 1,000 PEOPLE IN EACH COUNTRY WERE ASKED; WHAT IS YOUR MAIN MODE OF TRANSPORT FOR DAILY ACTIVITIES? Cycling is so common that I have been rebuked for asking people whether they are cyclists or not. “We aren’t cyclists, we’re just Dutch,” comes the response. The bike is an integral part of everyday life rather than a specialist’s accessory or a symbol of a minority lifestyle, so Dutch people don’t concern themselves with having the very latest model of bike or hi-tech gadgets. They regard their bikes as trusty companions in life’s adventures. In that kind of relationship it is longevity that counts – so the older, the better. It’s not uncommon to hear a bike coming up behind you with the mudguard rattling against the wheel. If anything, having a tatty, battered old bike affords more status as it attests to a long and lasting love. The famously flat Dutch terrain, combined with densely-populated areas, mean that most journeys are of short duration and not too difficult to complete. Of course, the cycle paths lend themselves to sauntering along in summer dresses in a way a death-defying, white-knuckle ride in rush-hour traffic does not. It is also partly because of this that people don’t need showers at work to be able to commute by bike – it’s a no-sweat experience. 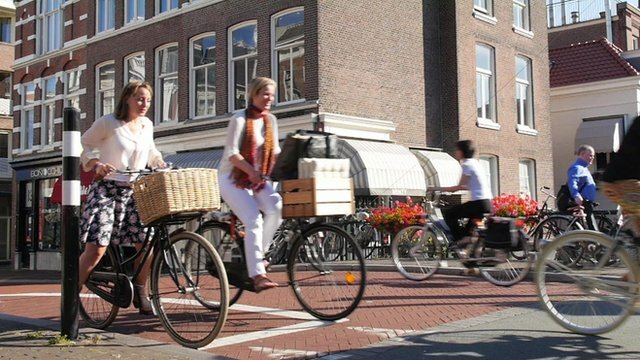 Dutch people also tend to go helmet-free because they are protected by the cycle-centric rules of the roads and the way infrastructure is designed. If you see someone wearing a cycling helmet in The Netherlands, the chances are they’re a tourist or a professional. I bought a helmet for my ride to the UK reporting for BBC Newsnight on the differences between cycling in The Netherlands and the UK. My local bike shop had just one on display, which the shop assistant said had been there “a few months or maybe a year”. The fact that everyone cycles, or knows someone who does, means that drivers are more sympathetic to cyclists when they have to share space on the roads. In turn, the cyclists are expected to respect and obey the rules of the road. 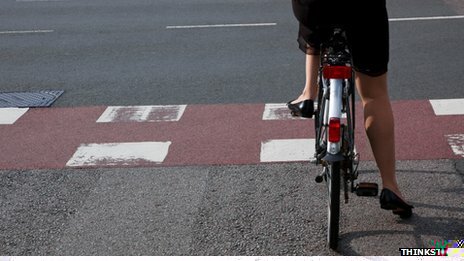 You may be fined for riding recklessly, in the wrong place or jumping red lights. Police (often on bikes) will issue a 60-euro ticket if you are caught without lights at night, and you will have to shell out even more if any of the mandatory bike reflectors – of which there are many under Dutch law – are missing. Accidents do still happen of course, but in the event of a collision involving a cyclist, insurers refer to Article 185 of the Dutch Road Safety Code which deals with something called “strict liability”. It is often mistakenly interpreted as a law that establishes guilt. What it essentially means is the driver will usually be expected to cover at least 50% of the financial costs to the cyclist and their bike. When out on the road, Dutch cyclists feel powerful and protected, making the whole experience much more enjoyable. There are dangers on the roads, but very rarely do they involve heavy goods vehicles, poorly designed junctions or dangerous drivers.